Pinfa: JJI Technologies’ amino phosphate based flame retardant system JJAZZ has passed the ASTM E84 Class B Standard Test Method for Surface Burning Characteristics of Building Materials. The test looks at surface burning, measuring flame spread, temperature and smoke density. The product is designed to improve materials’ physical performance, increase fire extinguishing efficiency, and simplify compounding. The flame retardant is available as a powder and pelletized concentrate form intended for use in polyolefin plastics, is halogen-free and conform to EU Restriction of Hazardous substances (RoHS), EU Waste Electrical Electronic Equipment (WEEE), and Canadian Challenge regulations. Scientific.NET: In recent years, diphenolic acid (DPA) has been attracted much attention because it can be produced on large scale from phenol and levulinic acid, a potentiel platform chemical from biomass. poly(diphenolic phenyl phosphate)(poly(DPA-PDCP) was synthesized and used as in ABS as FR . Acrylonitrile-butadiene-styrene (ABS) was treated with various formulations containing an intumescent fire retardant, which consists of ammonium polyphosphate (APP) and a novel char-forming agent, poly(diphenolic phenyl phosphate)(poly(DPA-PDCP)). The behaviour of this intumescent system was investigated by thermogravimetric analysis (TGA), LOI test and cone calorimeter test, respectively. 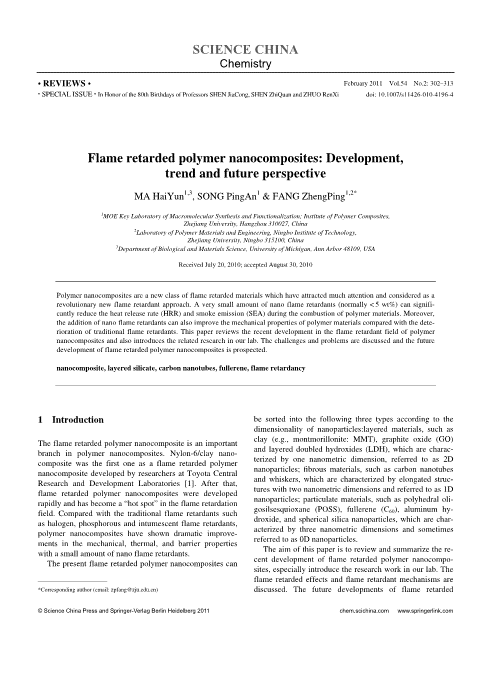 The results showed that the addition of poly(DPA-PDCP) enhanced the thermal stability and flame retardancy of ABS/APP. The weight of residues improved with the addition of poly(DPA-PDCP) . SEM investigations of residual char burning after cone calorimeter test revealed that poly(DPA-PDCP) plays an stimulative role in the process of carbonization. The intumescent chars formed from ABS/APP/ poly(DPA-PDCP) composites were intact and strong. It is confirmed that the poly(DPA-PDCP) is an efficient char-forming agent for flame retardant ABS resin.